NASA's Swift spacecraft will detect gamma-ray bursts, the most powerful explosions in the universe, for asronomers to study. 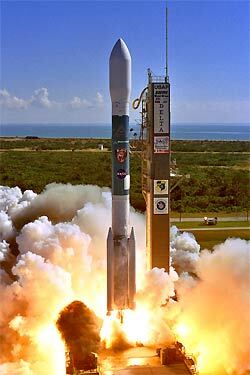 Cape Canaveral's Launch Complex 17 is the East Coast home of Delta 2. CAPE CANAVERAL, Fla. - NASA launched a $250 million quick-response satellite today to study enigmatic gamma ray flashes from brief-but-titanic deep space explosions that may be the "death cries" of massive stars imploding to form black holes. The Swift satellite's 126-foot-tall Boeing Delta 2 rocket roared to life at 12:16 p.m. and quickly thundered away through a mostly clear sky. Arcing east over the Atlantic Ocean, the slender rocket put on a spectacular sky show for area residents and tourists as it climbed away toward space. It will take engineers about a month to check out and calibrate the satellite's three gamma ray, X-ray and optical telescopes before scientific observations can begin. If all goes well, Swift will detect at least 200 gamma ray bursts during its two-year primary mission. Discovered during the Cold War by U.S. military spy satellites on the lookout for Soviet nuclear activity, gamma ray bursts are among the most perplexing phenomena in modern astronomy, the most powerful explosions since the big bang birth of the universe. "Every aspect of gamma ray bursts boggles the mind," said principal investigator Neil Gehrels. "They're very short flashes of gamma rays that last just a few seconds. But they're very bright. They're the brightest thing in the gamma ray sky when they're going off. "If you had gamma ray vision, it would be like sitting in a dark room with a flash bulb going off a few times a day. They're that bright." So bright, in fact, they briefly shine with the intensity of a billion billion suns before quickly fading from view. "In scientific terms, it's 10 to the power 52 ergs," Gehrels said at a pre-launch news conference. "To put that into perspective, it's more energy coming out in this short flash of gamma rays than the sun emits in its entire lifetime, billions of years, at all wavelength bands. "How can you possibly make so much energy in such a short amount of time? We don't really know," he said. Because gamma ray bursts appear so bright and evolve so rapidly, astronomers initially thought whatever was producing them must be relatively nearby, somewhere within or around the Milky Way galaxy. But satellite observations in the mid 1990s showed the bursts were, in fact, extra-galactic, occurring at extremely remote distances. That meant the explosions that produce the gamma rays must be truly titanic by even astronomical standards. "It's only about seven years ago that astronomers learned that gamma ray bursts were not local but they came from outside of our galaxy, that they were, in fact, cosmic events, not local events," said Anne Kinney, a senior science manager at agency headquarters. "People were very resistant to this idea because that immediately implied that they were immensely powerful events." So powerful, they may have played a role in the evolution of life on Earth and on other planets throughout the cosmos. "If a gamma ray burst occurred within a few thousand light years of Earth, it would strip the atmosphere off," Gehrels said. While the possibility of such a nearby detonation is extremely small, "it may have happened once during the time that there was life on Earth, perhaps not." "But it is still a very interesting question because whenever a gamma ray burst goes off, there are presumably stars with planets around it and those planets do have the atmosphere stripped off," he said. "And so we can think about how many planets there are with life on them and how long life lasts in the context of both asteroid extinctions and gamma ray bursts. So it is a factor in terms of life-forming planets." Gathering data to help scientists figure out what causes such unimaginable explosions is the goal of the Swift satellite, an international spacecraft equipped with three telescopes and computer software capable of spotting bursts and quickly repositioning the spacecraft to observe the afterglow before it fades from view. It's that quick response that sets Swift apart from all earlier efforts to study gamma ray bursts. To appreciate the problem, consider Gehrels' flashbulb analogy. Imagine sitting in a dark room, instruments at the ready, to study the light from flashbulbs popping off randomly around you. By the time you could aim your instruments in the direction of any given flash, it would have faded from view. But the appropriately named Swift is up to the challenge, equipped with six oversized, spinning reaction wheels that can be spun up or down on computer command to quickly reorient the spacecraft in time to observe the afterglow of a burst. The initial detection of a burst will be made by the wide-field Burst Alert Telescope, built by NASA's Goddard Space Flight Center. Then, after the satellite has been reoriented, the afterglow will be studied in detail by the X-ray Telescope built by Penn State University, the University of Leicester and Italy's Osservatorio Astronomico di Brera. The radiation also will be captured by the Ultraviolet/Optical Telescope, built by Penn State and the Mullard Space Science Laboratory in Britain. The satellite itself was built by Spectrum Astro. "Swift is just the right tool needed to solve this mystery," Gehrels said. "One of Swift's instruments will detect the burst, while, within a minute, two higher-resolution telescopes will be swung around for an in-depth look. Meanwhile, Swift will 'e-mail' scientists and telescopes around the world to observe the burst in real-time." Along with alerting large ground-based observatories and other space telescopes to an evolving burst, Swift's own instruments will spectroscopically analyze the radiation to shed light on the processes that created it. One possibility is the collision of two ultra-dense neutron stars or a black hole and a neutron star. But the most compelling theory holds that bursts are generated when super massive stars run out of nuclear fuel and collapse to form black holes. "When black holes form, there's a lot of mass, gas that falls down into the black hole and creates it," Gehrels said. "That gravitational potential energy is the source of the energy that powers these gamma ray bursts in this model of black hole origin. So it's gravitational energy that we're collecting. "Of course, you think about black holes as just swallowing light and light can't come out. But as the gas flows down into the black hole and creates it, it gets extremely hot and a significant (amount of radiation) is emitted. We don't know exactly how that would come out, shooting out as gamma rays, but that's one of the things we want to learn with Swift." Stars maintain their equilibrium by balancing the inward pull of gravity with the outward pressure of thermal radiation produced by nuclear fusion in the core. When the fuel in a star's core is exhausted, gravity dominates and the core contracts. Eventually, the pressure in the core or surrounding layers becomes so extreme that heavier elements begin fusing and equilibrium is briefly restored. What happens after that depends on the star's original mass. When average-size stars like the sun finally exhaust their fuel, fusion stops and they contract to a point where quantum mechanical effects prevent further collapse. But the density in the core is not high enough to support continued fusion. The result is a slowly cooling white dwarf. For more massive stars, those quantum effects cannot offset gravity and the collapse continues until protons and electrons are crushed together and yet another quantum effect kicks in to prevent further contraction The result is an ultra-dense, ultra-compact neutron star. But for super massive stars, even those atomic forces are not enough to stop gravity. The result in those cases, astronomers believe, is a black hole, a so-called singularity that effectively vanishes from the known universe. "The black hole is actually formed in a very short collapse," Gehrels said. "And at that same time that it's being formed, the gamma rays come out. It's almost simultaneous. But essentially, the black hole's first and then the gamma rays are shooting out." Super massive stars burn their nuclear fuel much faster than smaller stars like the sun and many of the gamma ray bursts observed to date occurred in the remote past among the first generations of stars to form after the big bang. "Gamma ray bursts happen throughout the universe," Gehrels said. "And the reason we're seeing them at these great distances is because the average galaxy is billions of light years distant from us. Early in the universe, there may have been more massive stars forming. The purported population 3 stars that scientists think formed (early), those could have produced larger gamma ray bursts or a higher fraction of those stars may have made gamma ray bursts. But we don't really know for sure. "There may have been more in the early universe than there are now. But in general, any place where there's star formation going on, even in this epoch in galaxies nearby us, you can produce massive stars and make gamma ray bursts. So this happens throughout the universe." Swift's launch originally was scheduled for October, but the flight was delayed in the wake of three hurricanes that blew through Florida and by a longer-than-expected campaign to launch a Delta navigation satellite from an adjacent pad. Launch this week slipped three more days because of trouble with the rocket's self-destruct system. Liftoff today came six minutes late because of minor countdown snags.